Copper is absorbed in the small intestine and enters the liver via the portal vein. In the liver, copper is incorporated into ceruloplasmin or copper-containing enzymes and excess copper is secreted into the bile. The precise intracellular target for the toxic action of copper is unknown. Copper is potentially toxic because of its ability to promote free radical formation. Lipid peroxidation of membranes and organelles as well as modification of mitochondrial DNA and alterations of protein synthesis are described in patients with Wilson disease. The Wilson disease gene, ATP7B, encodes a P-type ATPase that acts as a membrane copper-transport protein. In hepatocytes, ATP7B is located in the trans-Golgi apparatus where it functions to incorporate copper into ceruloplasmin and to excrete copper into the bile. [12,13] Although the genetic defect in Wilson disease resides primarily in the liver, ATP7B is also expressed in a variety of other tissues including kidneys, brain, heart, muscle, and pancreas. 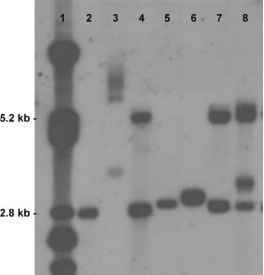 Human ATP7B is approximately 50 kb, has 21 exons, and is located on the long arm of chromosome 13 (13q14.3-q21.1). The gene product consists of 1465 amino acids. It forms eight transmembrane domains with most of the protein residing on the cytoplasmic side. In addition to the characteristics of all P-type ATPases such as the ATP-binding site, the phosphatase domain, and the motif containing aspartyl phosphate, ATP7B contains six N-terminal copper-binding motifs.